As requested, listed below are the graduation rates for each high school in PWCS. They are listed overall and for economically disadvantaged (ED) and not economically disadvantaged (not ED) students. They are also listed for Males and Females, as that was a shocker yesterday. If the numbers are too small for you to read, like they are for me, here’s a pdf of the same file with larger print ===> By school grad rates – 2013. They’ve also been uploaded to the Test Scores page, which has lots of data for you to look at if you ever get bored and want to look at numbers. Note: Report is updated below the chart to clarify what these %’s mean. The numbers presented in the chart above are the percentage of that population of students that graduated with a particular type of diploma. For instance, 100% of the ED students at Brentsville who graduated, achieved a Standard diploma. That doesn’t mean 100% of Brentsville’s ED students graduated. 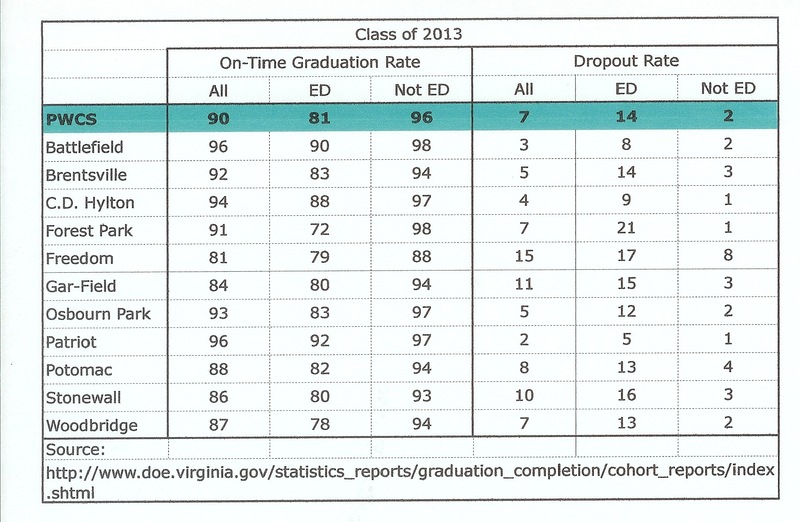 The chart below is the on-time graduation rate and drop out rate for each school in the county. Carrying on the Brentsville example, in the class of 2013, 83% of Brentsville’s ED students graduated on-time, with 100% of them achieving a standard diploma, 14% dropped out, and the rest either earned a GED or are still enrolled.